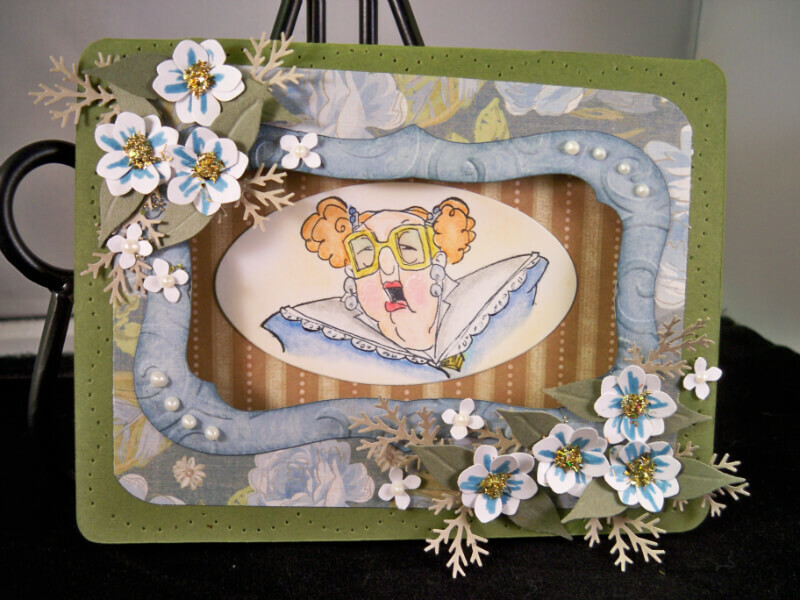 I made this window card base for last weeks Thursday’s challenge , I picked out the papers and made the base and the decided it was not going in the direction I wanted ,so I re-grouped and I thought it was going to be better matched for a Lovelle ( sku # L2620) card but I did not have that stamp yet so I ordered it and set the base aside until I got her . 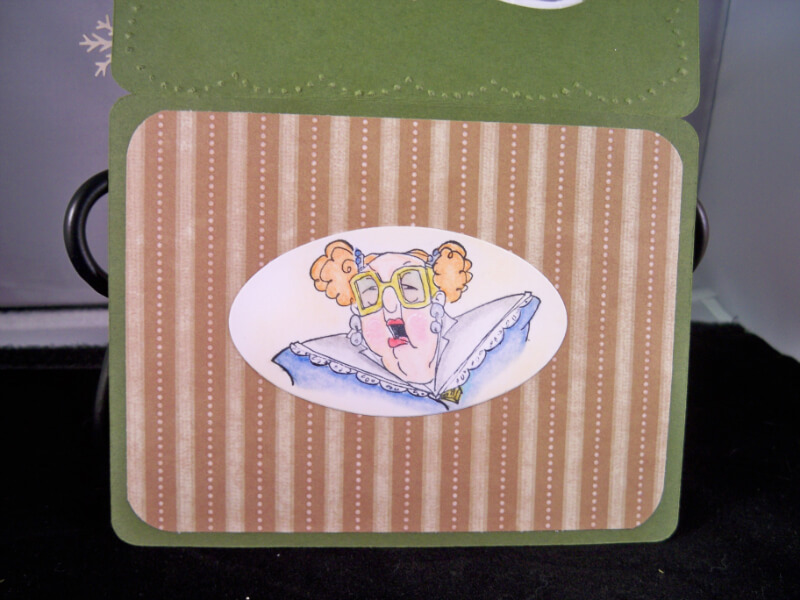 Well Lovelle is here and I think she looks right at home in this card , I colored her with my colored pencils and the used gamsol with the pencils , my pencils are wax based and what gamsol does is melt the wax and blends your pencils very well , this is the first time I have ever used this method so you can see you don’t have to be a pro to get awesome results , I chalked around the image with a golden tan chalk to give a glow effect and to pull in the background paper , I then cut her out using my oval dies .I added flower sprays around the front window opening , I used a glitter mix me and my friend Rhonda (www.paperprayers.com ) made. The flowers are made from a Martha Stewart Hydrangea punch from white cardstock then to used a SU ballet blue marker to add some interest and dimension to them only on the center of each petal.The fern branches are from a Martha Stewart punch .I also added Viva decor pearl pen in pearl white around the window and in the center of the ting white flowers. 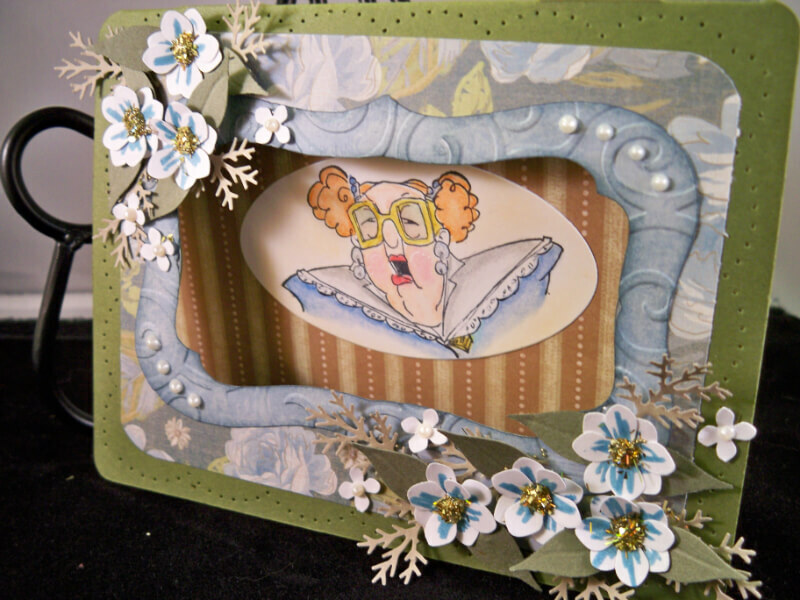 Glossy accents were added to Lovelle’s glasses.Around the card base frond I did some paper piercing in scallops , the window trim was ran thru the swirl embossing folder and the inked with bordering blue , this will make the swirls stand out more , I love how it all came together .